My dream is simple : populate FG world with data from these kind of website. Imagine : you are in your home and an aircraft is in the sky, you run at your computer and start FG then you can fly around the aircraft that you have just see in real life. I think this feature can bring a lot of realism for FG. For example you are at EDDF and in real life there is a 777 landing, in FG the same thing appear. In other words : AI traffic in FG is in fact real traffic in the world in real time. 3) once we have to create a network packet filled by exctracted datas and send it every 20 seconds on the Multiplayer network. This work should be done by a special server/tool. I have already make some experimentation : i am able to create AI aircraft in local session with data from planefinder.net. In this way I have a dozens of aircraft in my /ai/models/aircraft[n] with data refreshed every 20 seconds. Undortunately this solution doesn't create a real AI aircraft but create only a simple Node in the property tree. response = 406; // 'not acceptable', anything better? If you are able to compile FG with this change and add the real_time.nas file in $FG_DATA/Nasal you just need to set the /sim/traffic-manager/real-traffic property to True and you will see your /ai/models/ tree growing with aircraft[n] who represent aircraft position currently flying in real life. Of course this technical solution is not the good solution. The good solution is to follow instructions available at the top of my post. I have spent a lot of time reading flightgear/src/MultiPlayer/multiplayermgr.cxx I have also read the mpdummy tools and the fgms source code, but my skills in C++ are not sufficient for create a standalone tool who create network packets ready to be sent on FG network. - What do you think about this feature ? - Do you think that adding real traffic in real time inside flightgear is not an interesting feature ? or per contra you thing this feature should be really great for the realism ? - Who is able to create this kind of tool ? Last edited by F-JJTH on Sun Oct 07, 2012 7:29 pm, edited 1 time in total. The fact that you have some sample code should give your idea some momentum. Thanks you for the answer Hooray. Finally I have finished the parse of planefinder.net data. My next step is to make some clean in aircraft data (some aircraft from planefinder.net are without callsign for example). After that I need help for the creation of the network packet. I have really no idea how to format network packet matching FG format. My main problem for now is that FGMS considering the client as died after 10 seconds without receiving data from the client. Unfortunatly my tool take 1m30s to run. Another solution is to predict the next position of the aircraft by computing current position/airspeed/heading and send this predicated network packet over network waiting the end of the next loop. I think this technical solution need threading and I don't know nothing about it. For information I called this tool "fgais" for FlightGear AI Server. Ok, finally I have successfully create what I want, or at least the beginning of it. After some test the result is clear : FGAIS can't be used on MP because there is too many data. mpmap01.flightgear.org is completely out when I send data to fgms. Now I need to investigate at flightgear in order to see if flightgear is able to handle 2 input connection at same time. A big works is to create a table of correspondance between aircraft model given by FGAIS and AI aircraft. F-JJTH wrote in Sun Oct 07, 2012 7:42 pm: FGAIS can't be used on MP because there is too many data. mpmap01.flightgear.org is completely out when I send data to fgms. In March 2008, the main fgms multiplayer server (pigeond.net) was reported to consume approximately 15 gb of bandwidth per day, with an average throughput of 200 kB/sec and peak loads of up to ~ 650 kB/sec. F-JJTH wrote in Sun Oct 07, 2012 7:42 pm: A big works is to create a table of correspondance between aircraft model given by FGAIS and AI aircraft. I guess this might help: ICAO DOC 8643 - Aircraft Type Designators, or more specifically this list: Part2 - By Type Designator (Decode) (PDF). If it works it can probably be reused in other places in FlightGear. This is really great work! Can you share the code for FGAIS? I had something similar to your JSON/Nasal client working a while ago for ship AIS, but didn't have the time to develop something more substantial. The current MP system probably isn't able to deal with this amount of "traffic" at the client-side - thus, it might make more sense to develop this as a server-side module, that can be run as part of the fgms process. @Johan G: your PDF file seem to be exactly what I need ! thanks you ! I will be busy for the next of the week I think I will be able to continue my work next week. Like I said earlier, it would make sense to start moving the implementation to the fgms side of things - and away from the client. That would allow us to have a single fgms instance, just for aircraft/vessel traffic - without doing all the parsing at the client side. @stuart: let me know if you are ready to participate at the development of this tools. - My tool is not able to update position of aircraft. Each 6 seconds every aircrafts are deleted then re-sent like new aircraft. I can't compare previous position with current position for example. it's a big problem because acceleration/velocity calculation is impossible. - My tool should send aircraft position of the previous position in order to keep a position in advance for interpolation calculation. Currently my tool parse aircraft position then send them over MP. But he should parse aircraft position, then parse a second time aircraft position in order to know if the aircraft is moving (heading change, climbing, descending) then send the acceleration/velocity. In this way the client receive the real time - 1 position. Thanks for the source - I'll have a look at it over the weekend. I'm very interested in participating, though I have a slight concern about using data from the websites without permission. Have you spoken to anyone at the source websites about using their JSON feeds in this way? Yes, I think that makes a lot of sense. This should be a fairly straightforward change to make - just a marker on the MP traffic and a filter on the FG side. That should be straightforward to add if your server can receive MP information. Then it might be possible to plug a single fgais instance in the MP network. That should be fairly easily solvable. I'll probably take a look at this first. Like Stuart said, that's a simple change - but the question is if we WANT to do that (scraping the API at the client-side, i.e. fgfs): Stuart mentioned his concerns regarding "scraping" the JSON API here. The API provider may surely be affected by dozens of fgfs clients scraping his API like that simulatenously, especially given the amount of traffic. On the other hand, scraping the API by just a single process (i.e. fgms) and distributing the data via the MP protocol, would not be as invasive. So, I'd make sure to keep such considerations in mind - web APIs like JSON are usually metered based on requests per second/minute. The API provider may be fine about us doing that once per second, but probably not dozens of times per second, from multiple contents/countries - which would equal a DDoS attack in a worst case scenario. However, we would obviosuly want to make sure that the API provider is not in any way affected by us using his data feeds like this. I know, I've been told more than once that my postings sound like "lecturing" people at times - but, I'd still suggest to keep basic software design rules in mind here - otherwise, we may be spending time developing this feature, only to get the API use privileges restricted (or even revoked) shortly thereafter, because the API provider wasn't aware of our "broken design" and the implications of it onto his business. Don't get me wrong, I don't disagree with the feature at all - just the way it's implemented currently, I am simply not sure if it's future-proof. stuart wrote in Fri Oct 12, 2012 8:59 am: though I have a slight concern about using data from the websites without permission. Have you spoken to anyone at the source websites about using their JSON feeds in this way? It was why I wouldn't release the source code... And I was persuaded to received this kind of "warning" from someone. I had sent a mail to planefinder.net in order to tell what I want to do. Unfortunaltely I haven't received answer... Without prohibition from them I consider that's authorized... Also the consultation of their website is a free access. My tool just accessing to their data like million of person who access at their website. I don't store any data in DB or whatever it's just a consultation tool. If it's a problem for FlightGear I can continue my work alone and use it only for me without sharing the source code and the binary and consider this tool like a restricted tool. I'm involved in the free and open source FlightGear Flight Simulator under GNU GPL licence. 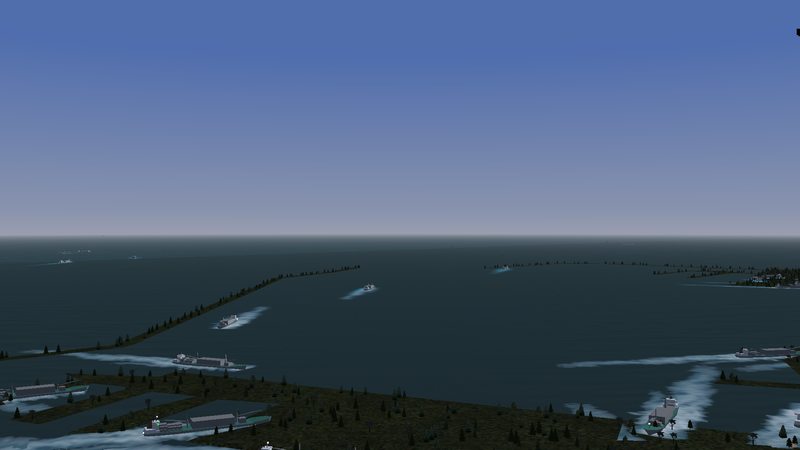 I plan to work on a new feature for our flight simulator : display real traffic in real time. This new feature adds a lot of realism to the flight simulator since the user can fly with real flights in real time. Before starting to implement this new feature I would like to know if you would be ready to authorize FlightGear to use your data available on "planefinder.net" and "shipfinder.co" ? Technically we just need a script which list all aircrafts / ships position in a limited area. Let me know if you are interested and what kind of condition suggest you for this ? I'm agree your point of view. As you said the good solution is to use fgais like a server and not like a client in order to limit the number of request to the provider. 2) fgais should calculate the move of each aircraft in order to interpolate/calculate the position between each request to the provider. (We receive "real" position of aircrafts every 20 seconds but we calculate the new position every 4 seconds = 5 "fictive" position for 1 "real" position. 4) fgais should be able to send aircraft position as AI traffic instead of MP traffic (need to create a new "Magic Header" like it's already done in fgms for relay/tracker and add a filter in flightgear in order to make the difference between AI traffic and MP traffic. What about having the airplane delayed by a bit (e.g. show it 3 seconds behind it's real position) so that we could have time to calculate better interpolations and have it (more) smoothly go to the next position if the calculated one was off? This might be a bad idea but the flightgear user shouldn't notice anything "wrong" with it being a bit behind, they should only notice if a big correction was needed from the calculated path. I like this idea, Clément, thanks for suggesting and working on it! P.S. What kind of information do we receive? I suppose we probably can't get pitch and roll, right? Nope, just positional information - no orientation (pitch,roll,yaw) - to come up with plausible values for these, one could use a lookup table for different types of aircraft, and then check the history of speeds (groundspeed, vertical speed, rate of turn), so that the 3D model could be oriented plausibly, depending on the trend of speeds. Obviously, some "guessing" would still be involved to deal with aircraft-specific details like the current configuration (flaps, slats, gear, lights etc).